Games of chance are past-time interwoven into present-day society. Gambling of any sort was once outlawed in many societies, however in some; it has become more and more an established part of everyday life. So where did gambling start? The identification of one definite place or moment in which gambling first began is unfeasible. All of recorded history contains occurrences of gambling, and it can only be extrapolated from that reality that gambling predates history extensively. 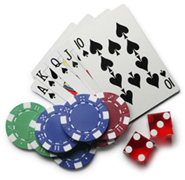 It can most likely be assumed that gambling has existed almost as long as mankind. The earliest recorded forms of gambling were exceptionally simple in nature but didn't vary extremely from modern-day incarnations. Dice and card games were familiar in ancient cultures, which is remarkable considering the fact that many modern casino games still rely on these two ancient gaming tools. http://objedi.com Awesome blog. I enjoyed reading your articles. This is truly a great read for me. I have bookmarked it and I am looking forward to reading new articles.Keep up the good work!